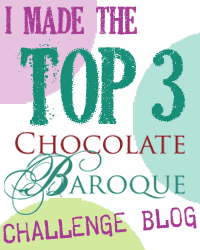 This is a submission for the Chocolate Baroque Challenge 11. I hope you enjoy it as much as I did making it! 1) Load up the stamp with versafine black and stamp onto scrap paper, this is to be used as a template for husking the dragonfly wings. 2) Place pins around the "clear" dragon flies wings and husk using a triple wrap, do each wing individually using the opal green paper. Repeat this until you have done all the wings on all the dragonflies. (husking involves wrapping quilling paper around the pins to create a shape). 3) Once you have constructed all the wings, cut 1 and 3/4 inch strips of the opal green quilling paper and create S scrolls to fill the wings. 5) Using versafine black load the AYOS May stamp and print onto white cardstock, once dry cut out the dotted background. 6) Get some watercolour paper and using the two blues from the perfrect primary aquatint range, apaint a background to look like water (I alternated and used water to blend), allow this to dry. 7) Once the watercoloured background is dry matt the cut out stamp on to it, colour in the background of the plain dragonflies using the silver sakura pen and start to mount the quilled dragonfly wings, I did all the wings and then added the scrolls. Make pegs (tight circles) for the bodies using the opal green. 8) Using versamark, load up the stamp and imprint onto the watercolour card and emboss using the silver powder. 9) Using water pens colour the embossed wings using the grape jelly and picked raspberry inks to colour the wings, cut them out. 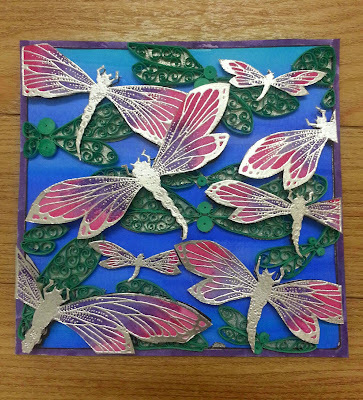 10) Mount the embossed dragonflies at different heights using the decoupage foam and the quilling to create depth. 11) Use the grape jelly ink to create a border with the water pens.